The Dramatic Growth of Open Access continues! This quarter, more than 3 million publications were added to Scientific Commons, 1 million records to OAIster; the DOAJ stands at 3,668 titles, and has added 822 titles (net) in the past year, for an average daily addition of 2.25 titles. The percentage of the world's scholarly literature that is freely available appears to be close to 20%. PubMedCentral includes 2.4 million free items; 375 journals provide immediate free access to contents, and addition of 20 in the past quarter, and 257 journals provide immediate open access. There are 53 open access mandates in the world, with more to come; and more than 15,000 blogposts on Open Access News! For full data, please see the following. Please note that there are two different figures for PubMedCentral, one from an Entrez PubMed search (see the PMC worksheet), and the other from the Registry of Open Access Repositories, likely a subset of PMC, maintained in Dramatic Growth for purposes of comparison with earlier figures. For further analysis, commentary, and links to previous issues, please see the Dramatic Growth of Open Access Series (English), or the Japanese translation. IJPE followers please note: this post is early! I had meant to wait until International Open Access Day, but posting this right away makes more sense. Are Elsevier prices going down yet? According to correspondence from an Elsevier correspondent to Rosie Redfield, Elsevier is charging authors a rather substantial amount ($3,000 per article), because they do not plan to charge subscribers for author-sponsored content. Has any librarian heard the other side - subscription fees going down because of author-sponsored content? Update September 28: kudos to the Max Planck Society (MPS) for a really ingenious approach! The MPS will pay the publication charges if the first author is affiliated with MPS; however, they will ONLY pay the amount for an article formatted properly according to the technical specifications. If the author chooses to submit an article that will cost more because more work is needed, they can do so, and pay the difference. The open access journal Hydrology and Earth Systems Science uses an approach they call service charges which may be of interest to publishers looking for ways to transition to open access. Service charges vary by the number of pages (not unlike the traditional page charges), but also by the format the author uses to submit articles. In other words, an author can keep the fee down by submitting in Latex rather than Word, and/or by submitting according to the technical specifications for either Latex or Word. A 10-page article submitted in Latex according to the technical specification is €450 + 19% VAT, $657 US before taxes, $800 US total with taxes. Not bad! Authors can choose to pay for copyediting, or take responsibility for this themselves. The service charges approach seems to have some merits. At the very least, it is helpful, in my opinion, to think about publishing as a service. This post belongs to the series Resources & Tips for Publishers. Today the U.S. National Institutes of Health released an announcement of NIH Director Elias A. Zerhouni's intention to step down October 28 to pursue writing and other professional opportunities. Dr. Zerhouni has led the NIH through the long process of the NIH Public Access mandate, first the voluntary policy, then the mandatory one, most recently speaking up forcefully for the NIH and against the absurd Conyers bill. The NIH is the world's largest medical research funder, and from my viewpoint, this is one of the OA initiatives that has been the subject of the most intense lobbying efforts. Thank you, Dr. Zerhouni. Public access is a great gift to the world; it is appreciated, and you will be missed. This is only one of Dr. Zerhouni's many accomplishments, outlined in detail in the NIH letter. Update: please note that the estimate of 9.3% are the articles in fully gold journals. The number of OA articles including hybrid journals, and numbers of articles that become OA only after an embargo or delay, is not included in this number. About 9.3% of the world's peer-reviewed journal articles are now fully gold! This is double the number reported for 2006. Another sure sign of the Dramatic Growth of Open Access!. Björk et al. (2008) calculated that of the estimated 1,350,000 journals articles published in 2006, 19.4% are freely accessible (4.6% OA immediately on publication, 3.5% freely accessible after an embargo, usually at least on year; and 11.3% through self-archiving). From: Björk, Bo-Christer, Annikki Roosr, and Lauri, Mari. Global annual volume of peer reviewed scholarly articles and the share available via different open access options. ELPUB2008. Open Scholarship: Authority, Community, and Sustainability in the Age of Web 2.0 - Proceedings of the 12th International Conference on Electronic Publishing held in Toronto, Canada 25-27 June 2008 / Edited by: Leslie Chan and Susanna Mornati, 2008, pp. 178-186. DOAJ currently lists 3,653 journals, about 15% of the world’s peer-reviewed scholarly journals, and is adding new titles at a rate of more than 2.2 per calendar day. If we multiply the number of journals in DOAJ (3,653) by the mean number of articles / OA journal calculated by Björk et al. (2008), of 34.6, we get an estimated total number of articles that are fully OA of 126,393, 9.3% of the total estimated output of 1,350,000 estimated by Björk et al., or twice as much fully gold OA now as there was in 2008. Please note that this is a rough estimate. The 1.35 million articles per year has likely increased by about 7-8%, based on average increases of about 3-3.5% per year. 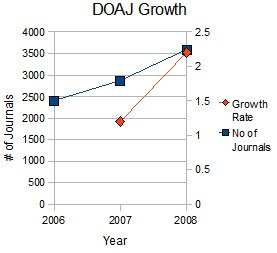 This figure has not been changed for the estimate, as the 34.6 articles / OA journal may also have changed; it is possible that the average number of journals per article has increased as awareness of open access increases, and as some of the OA journal start-ups have been around for a while and are beginning to attract more submissions. Apologies to e-mail subscribers for the duplication; I accidentally posted two versions of this in draft. Open Access as a concept can apply to either a work, or a process. I believe that this distinction would help in making our definitions of open access more precise. This distinction is not quite the same as the distinction between noun and verb. Open Access work: a work can be said to be open access when it is, at minimum, free for anyone, anywhere to read online (gratis open access), or, better yet, free for anyone to re-use (libre open access). A work that has been closed access for the full term of copyright, can be made open access after it enters the public domain. Open Access process: a process, such as publishing, can be open access as well. In this sense, it makes sense to reserve the term open access for full open access publishing, where a work is made open access (gratis or libre) as part of the publishing process, with no delay. One way to understand this distinction: when a journal employs a transitional strategy such as free back issues, it makes sense to say that the journal is NOT open access, but rather that it uses a free back issues strategy. The issues and the articles, as they become free, however, ARE open access. That is, it is the works that are open access, even though the journal / publisher is not OA. There is probably a better way to articulate this distinction; if anyone is willing to undertake this task, please do! To facilitate reuse of this work, this particular post is CC-BY. Precision in OA definitions is extremely important, partially because of the potential for confusion arising from the many changes in scholarly communications (and indeed, in our world) taking place all at once, and also because of lobbying efforts by those opposed to open access, which often take the form of opposing something other than what open access is (a good example being the Conyers bill in the U.S., which you can read about on Open Access News). This is a bit of reflection to prepare for writing the chapter on Open Access, Open Data, and other Movements towards Open for my forthcoming book Scholarly Communications for Librarians (Chandos Publishing). The Oxford English Dictionary could really use an update on its definition of Open Access. A job for Peter Suber, perhaps? For definitions of gratis and libre open access, see Peter Suber's article in the August 2008 SPARC Open Access Newsletter. Canadians - do you believe in open government? If so, please go to ibelieveinopen.ca and take the pledge today! As the dramatic growth of open access is itself growing, future updates of the Dramatic Growth of Open Access will be released in phases, rather than all on the same day. The quarterly time frame will remain as the date of data capture (March 31, June 30, Sept. 30, and Dec. 31), and the open data edition will be released on this day. Analytic and commentary versions will be released later, usually a week or two after the end of the quarter. Oct. 14 - International Open Access Day: Analysis and Commentary. This release will be planned for early in the day (possibly October 13 to accomodate different time zones), in case anyone would like to announce the very latest figures on OA Day. OA friends: if you need this information early for planning purposes, send me an e-mail. Watch for further developments in this emerging example of Canadian leadership in the open access movement. The Public Knowledge Project is pleased to announce that the second international PKP conference will be held from July 8 – 10, 2009 in Vancouver, British Columbia, Canada. The first PKP conference was an overwhelming success with presentations and participants from around the world. A selected set of conference papers was subsequently published in the October 2007 issue of First Monday. The conference will appeal not just to members of the PKP community, but to anyone interested in trends and developments for scholarly publishing and communication. There will be a wide range of topical sessions on new reading and publishing technologies; open access initiatives; alternative publishing and funding models; national and international collaborative projects; new roles and partnerships for libraries, scholarly publishers and others; and sustainability for open access publishing and open source software. Prospective and first time users of OJS and other PKP software will be able to learn more about the systems and establish contacts with the PKP community. Experienced implementers, developers, and system administrators will have an opportunity to participate in technical sessions and exchange information. The conference will commence with an opening keynote session on the evening of July 8 convened by John Willinsky, the founder of the Public Knowledge Project. There will be several pre-conference workshops on July 8, and the main conference program will present a combination of concurrent and single track sessions during on July 9 and 10. The conference will conclude with three special symposia on community and network building intended for each of the core PKP constituents: journal editors and publishers; librarians; and software developers. The conference will be hosted at Simon Fraser University’s downtown campus and will be adjacent to a wide range of accommodations, restaurants, and other popular tourist destinations. Please mark the July 8 – 10 dates on your 2009 calendars. The PKP partners look forward to welcoming you to the second PKP conference. The Public Knowledge Project is a federally funded research initiative at Simon Fraser University, Stanford University, and the University of British Columbia. It seeks to improve the scholarly and public quality of academic research through the development of innovative online environments. PKP has developed free, open source software for the management, publishing, and indexing of journals and current conferences. The PKP software suite is comprised of three modules in production: Open Archives Harvester, Open Journal Systems, and Open Conference Systems, and two in development: Lemon8-XML and Open Monograph Press. - Sustainability for open access publishing and open source software. Parallel sessions will each be up to 1 hour in length. They may consist of a workshop, a case study, a research report, a set of 3 presentations on a single theme, a panel discussion as well as other options. The Public Knowledge Project is a federally funded research initiative at Simon Fraser University, Stanford University, and the University of British Columbia. The partnership brings together faculty members, librarians, and graduate students dedicated to exploring whether and how new technologies can be used to improve the professional and public value of scholarly research. Its research program is investigating the social, economic, and technical issues entailed in the use of online infrastructure and knowledge management strategies to improve both the scholarly quality and public accessibility and coherence of this body of knowledge in a sustainable and globally accessible form. It seeks to improve the scholarly and public quality of academic research through the development of innovative online environments. It continues to be an active player in the open access movement, as it provides the leading open source software for journal and conference management and publishing. The research and publishing activities of the project have been reviewed and cited in Inside Higher Ed, Nature, New England Journal of Medicine, Science, The Scientist and others. CANLII Legal Open Access Database Most-Used Resource! CANLII, an open access Canadian legal database, is the most frequently used electronic legal resource in Canada, according to a recent CANLII Survey. Congratulations, CANLII! This post - and the CANLII initiative - are part of the Canadian Leadership in the Open Access Movement series. Hat tips to Michel Adrian on Library Boy via Gavin Baker on Open Access News. Dramatic Growth of Open Access - in Japanese! The Dramatic Growth of Open Access series is now available in Japanese. I am deeply honoured by this translation - many thanks to SUGITA Shigeki! This is yet another illustration of the wonder of Creative Commons. While I appreciate hearing about this translation, it is not necessary to ask my permission for this, because my Creative Commons Attribution-Noncommercial-Sharealike license gives permission in advance. What if I want to retain copyright in my own name? Whilst Taylor & Francis strongly recommends to authors that they transfer copyright, it is not necessarily a condition of publication. An author can retain copyright in her or his paper, but we must receive a formal signed statement licensing us to publish the work exclusively, worldwide, and in all forms, in the journal. Comment: congrats, Taylor & Francis - this is definitely a step in the right direction! This Red and Orange Butterfly on a yellow flower - France - July 2006 by Gaetan Lee provides a beautiful illustration of Creative Commons in action! This photo is licensed under the CC-BY (Attribution) license. So it's no problem for me to add this pretty picture to brighten up IJPE. With CC-BY, even commercial use is allowed! This is only ONE of the 192,822 flickr results with the word flower restricted to Creative Commons licensed work (as of Sept. 7, 2008), available for commercial use, and modifiable too! Sherpa RoMEO maintains a list of Publisher Copyright Policies and Self-Archiving. Publishers are identified by colour, with white being the least author-self-archiving friendly (self-archiving not formally supported), and green being the most author-self-archiving-friendly (self-archiving of preprints and postprints is permitted). As of today, even the Sherpa RoMEO white list is looking very green! This is because even a great many publishers with no overall policy supporting self-archiving, have green checks indicating compliance with funding agencies' open access mandates. Yet another sign of Transitioning to Open Access. As more publishers modify their policies to accomodate research funding grantees, watch for more and more movement towards full support for author self-archiving. The Self-archiving and free access option of the Society for Reproduction and Fertility is a good model, for traditional publishers transitioning to open access. Authors are allowed to self-archived a copy of their own final manuscript with no charge after a 6-month embargo, or, they can pay a Free Access fee for immediate free access, which includes re-use rights. The Society for Reproduction and Fertility makes some articles published in its journal freely available immediately upon publication, as a result of author-side financial support, usually funded by research funding bodies. These articles (hereafter referred to as ‘documents’) are also posted on PubMed Central (PMC) and PMC mirror sites. They are freely accessible and re-useable for non-commercial purposes, subject to the terms and conditions set out below. The fee of $2,192 US is lower than what some other publishers are charging (which is good)! What is missing? There is no indication that the Free Access Fee will take into account other sources of revenue (e.g. lower fees if the author is a member of a subscribing library). One element of the Society's policy that is not a good model (for publishers), in my opinion, is the disclaimer authors must post on free self-archived versions. Asking authors to link to the journal home page, even stating that the article is the author's manuscript, is fine. Pointing out that the article has not gone through copyediting, formatting, and proofreading might concern the reader so that they go to the final published version, and might convince the author to take up the Free Access option. However, there is also a risk of eliciting a "who cares?" reaction from the reader, and a desire to investigate other publishing venues on the part of the author. This post is part of the Transitioning to Open Access and Resources and Tips for Publishers. Another Canadian OA Librarian hero! Danielle Dennie, of Concordia University, Montreal, one of the principal bloggers of LibrarianActivist.Org. In addition to OA, Danielle is one of our experts on Net Neutrality. This post is part of the Canadian Leadership in the Open Access Movement series. Over at Social Justice Librarian, Devon Greyson has posted an illustration of Creative Commons in Action. Devon's post takes content from my post DOAJ growth rate nearly doubles in the past year, and adds content of her own, such as this alternative DOAJ growth chart, showing numeric growth as well as the accelerating growth rate. This to-and-fro is made possible by our respective Creative Commons licenses, CC-Attribution-Noncommercial-Sharealike for IJPE, and the very similar CC-Attribution-Noncommercial for Social Justice Librarian. Since we are both open access advocates and are interested in alerting people to this Dramatic Growth, we are both a little closer to our goal through the sharing of ideas and charts facilitated by Creative Commons, than we would have been if our work had been "All rights reserved" - or egads, toll access only! Here is a great article to send to faculty and university administrators! Peter Suber's Thinking about Prestige, Quality, and Open Access covers in some depth the reasons TA journals are so entrenched, even in comparison with newer OA journals of equal (or better) quality - and some thoughts on what can be done about this. For example, university hiring procedures could either focus on quality instead of surrogates such as the impact factors of journals faculty have published in, or, at the very least, at some of the newer surrogate measures that don't oversimplify as much as IF. Where my own perspective differs a little: I am more optimistic about change in the near term, and I think that there may be more happening already than what is readily visible. Authors may feel that they need to publish in the most prestigious journals, even if they are TA. However, my gut feeling (and various comments from researchers) tell me that it's a little easier to say no to a request to review after a publisher has said no to the open access you (or your funder) desire, and a little easier to say yes to the open access publication. As Peter points out, sometimes prestige and quality diverge; a gradual loss of reviewers may impact quality first, but will inevitably impact prestige, too. Librarians need not, and indeed are not, standing by on the sidelines. We are educating, providing support for open access initiatives, and beginning to look for open access-friendly policies as a positive in evaluation for purchasing decisions. As Peter emphasizes (and I agree), there is a great deal more that can be done to educate people about existing rights to deposit work that is published in TA publications, which allow author self-archiving. For example, Sherpa RoMEO recently posted a list of Publishers that allow self-archiving of the publisher's PDF without fee or embargo. Librarians - is there an e-mail going out to all your faculty who publish in these journals with a simple request - may we place this in this archive for you? Pam Ryan, along with colleague Denise Koufougiannakis, is one of the librarian movers and shakers behind the strong OA support at the University of Alberta Libraries. See Pam's personal blog for info on her library interests, which often include open access and scholarly communications. [Disclosure: I am proud to say that Pam Ryan and Denise Koufougiannakis are both former classmates at the University of Alberta's School of Library and Information Studies]. Meet Hugh McGuire, a Montreal-based engineer and open access / open data advocate. Among other accomplishments, Hugh is the founder of LibriVox.org, as he describes it: a project to make audio versions of every public domain book in the universe, and give them away for free. Thanks, Hugh McGuire! This post is part of the Canadian Leadership in the Open Access Movement series. Epilepsia has just announced their policy reflecting the National Institutes of Health Open Access Policy. Last spring, the U.S. National Institutes of Health (NIH) announced a new mandatory Public Access Policy (http://grants.nih.gov.proxy.lib.sfu.ca/grants/guide/notice-files/NOT-OD-08-033.html) that applies to final peer-reviewed manuscripts accepted for publication on or after April 7, 2008 (NIH). A similar policy had been announced earlier by the UK funding agency, the Wellcome Trust, applying to all research papers from October 1, 2006. These policies are designed to make published research that is funded by NIH and the Wellcome Trust accessible to everyone. From: Editorial Public (open) access policy. Epilepsia 49:8 (August 2008). Caution: toll-access only at Epilepsia. In response, Epilepsia will deposit all articles in PMC immediately on publication in PMC, for public access 12 months after publication. To meet the conditions of Wellcome Trust, Epilepsia requires payment of the Wiley Online Open fee. For a brief critique of the Wiley Online Open Fee, which appears to include print-based costs - click here. Epilepsia authors note: the majority of open access journals do not charge article processing fees. Of those that do, many charge much less than the Wiley Online Open fee. Here is a link to the Neurology section of the Directory of Open Access Journals, currently 54 fully open access journals in this section alone. Or, go to the DOAJ Author Search. To view traditional journals with author-friendly self-archiving policies, go to the Sherpa RoMEO Publishing Policies and Self-Archiving page. Note: be sure to look for a publisher that allows deposit in disciplinary archives, such as PubMedCentral, not institutional repositories only. Update Sept 1: Jim Till on Be Openly Accessible or Be Obscure notes that Epilepsia was already making all articles freely available after 12 months. This move will enhance accessibility by direct linking through PubMed, but makes no difference in access to Epilepsia articles. American Journal of Transplantation will deposit all articles in PMC! The American Journal of Transplantation has decided to react to the National Institutes of Health's Public Access Policy, by depositing all journal articles into PubMedCentral immediately on publication - regardless of funding sources - for public access 12 months after publication, the maximum embargo allowable under the NIH policy. The reason given for this decision is to avoid extra work and confusion for authors covered under this policy. This is a move in the right direction, so kudos to The American Journal of Transplantation for extending public access beyond the NIH-funded articles. Consider recognizing the contributions of society members and subscribing libraries, perhaps by providing for no embargo (or a shorter embargo) if the author is a member or the author's institution is a subscriber. Provide more information on both sides of this issue through further editorials explaining the reasons for, and benefits of, the Public Access policy. Editorial (caution - toll access only): AJT's Response to the National Institutes of Health Public Access Regulations. A. D. Kirk a and D. R. Salomo. American Journal of Transplantation August 22, 2008.